5 Verbs with the preposition "nach"
to (locative), after (temporal), according to (modal). It is used to introduce a destination. "Nach" is used with any toponym* (name of a place) that does not have an article. Wann fliegst du nach Amerika? When are you flying to America? * As long as they are not natural borders (rivers, seas) or islands. nach Hause is an expression that means home (As in “I’m going home”). Sometimes, this can even be found as an adverb in one word "nachhause". "Nach" is used to say the hour in German. 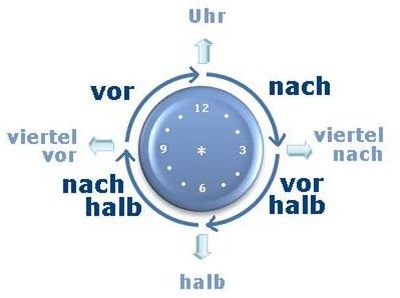 See the days of the week in German. See months of the year in Germany. One of the interesting things about German is that some prepositions such as "nach" can be placed before or after the words that they affect. Verbs with the preposition "nach"
"Nach" does not change, just like all the prepositions.. The words that follow nach have to be declined in the dative ("nach" takes always dative). Is 'Meiner Meinung nach' followed by a comma?